If you've followed this blog, you'll know that I have a soft spot for the grocery industry. It's the industry where I got my start. I pushed carts, stocked shelves, bagged groceries (and had a few crushes on cashiers in the process), received stock on pallets, ordered for the store, and eventually- at least for a while- managed the dairy section. IGA (Sobey's) was my employer and I was an IGA man through and through. Safeway and Loblaws were my sworn enemies. I was proud to work for IGA and today, I still have my 5 year pin and IGA tie in my treasure box. So, whenever I see headlines about grocers I get excited. When the topic involves branding and groceries, I get very excited. 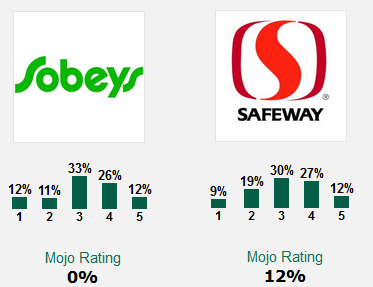 Here's what caught my attention last week: Sobeys to buy Safeway Canada for $5.8 billion. CTV News: "Marc Poulin, president and chief executive of Sobeys Inc., said the company is not sure whether it will be re-branding the Safeway stores." CBC News: "Unclear if dominant brand will be Safeway of Sobeys...Empire (parent of Sobeys) has not yet decided whether it will brand the new network of stores under the Safeway or Sobeys banner or keep the two brands independent." These are all really good arguments. But, it takes a marketer to bring the customer back into focus. And, those arguments need to be reminded that it is consumers who ultimately own the brand and the banners. A starting point for me here would be Brand Mojo which has been tracking grocery banners for 4 years. 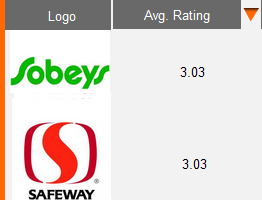 I've extracted some data to look at this case: Sobey's or Safeway banner. On the surface, it would appear that both banners are equal, at least from an average rating point of view. But, when we dig a little deeper into the hundreds of Canadian ratings on the two brands, and examine the ratios of lovers versus haters, we see some interesting information. Safeway and Sobeys have similar numbers of lovers, but Sobeys has picked up more "haters". That's a "stick" to keep away from the Sobeys name in the decision. I then dove deeper in to the data again by looking at women from western Canada only. Women from western Canada (as identified by ip address), are more than 2 times as likely to be lovers of Safeway than women from western Canada are to be lovers of Sobeys.That's a "carrot" to keep the Safeway name. Making the branded banner decision is a big one. But the Brand Mojo tracking suggests that there is a lot more to consider than the cost and operational savings.